The Hood Protector allows for ultimate protection through its sleek, low profile polished finish. The Hood Protector is made from a durable, yet flexible acrylic that withstands the wear-and-tear from the daily grind. 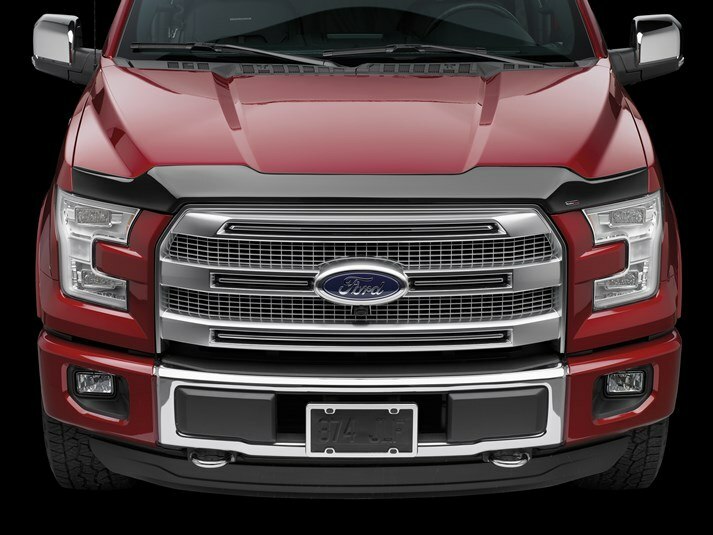 Through its exclusive, custom-fit design, the Hood Protector follows the hood’s contours with a wrap design that provides a sleek, aerodynamically-friendly finish. By providing a barrier against bugs and debris, the Hood Protector helps to preserve and maintain your 2009 Mazda Tribute's paint finishes. The Hood Protector mounts in minutes using strong 3M automotive tape without the need for drilling. The product is available in a dark smoke finish and is made in the USA. When installing your Hood Protector, please perform a couple test runs to make sure the product is in the exact placement before peeling the adhesive tape off. If you accidentally install the Hood Protector incorrectly and the adhesive tape becomes disconnected from the acrylic, please call our Customer Service team. I purchased the window vent shades and hood deflector. This is for a 1991 vehicle, so these parts aren’t easily available to find. Weather Tech had the parts I needed and had them on my doorstep in 2 days. Both items fit perfectly and look great. There is no doubt when you order from them, the parts will fit snuggly with no problems. Very fast shipping and easy installation. Perfect fit. Just installed the hood protector. Was worried it might make my truck look a little too accessorized, but two rock chips in an area that would have been covered by the protector made me change my stance. After the installation all my worries have been put to bed, it looks great and I know moving forward its going to protect that part of my hood from future chips. Really happy about my purchase. From Regular to "El Zorro"
The new addition to my SUB from Weather Teach has change my vehicle to a Superhero look. My SUB had already some damaged areas due to rocks, but now they were cover with this fantastic addition from WeatherTech, and will prevent from future ones. Easy to install and my SUB looks like a superstar. Easy to apply and looks like it came stock with my 2017 4Runner. I was skeptical at first but as soon as I put it on I liked it. I knew it was a winner when my wife, who isn't a car person, commented that it looked good. Purchased the hood protector for my ZR2. Arrived quickly and installed in about 15-20 minutes. Perfect fit and great look! The hood protector is great it’s slim and goes well with black accents on my vehicle however when it comes to install it’s a little difficult we do moldings at my job with double sided tape and it took a little while to figure the instructions i was also hoping there was more of a quiche to match up with the end of the hood rather then using tape but we did get it on a looks great just put about 30 minutes aside for install. Second one bought from Weathertech and as usual great Quality and easy to install, takes seconds. I have had two other hood protector/bug deflectors and this low profile hood protector is the best. Quality, appearance is perfect. What are the differences between the Hood Protector and the Stone & Bug Deflector? The Hood Protector is a “surface-mount” deflector that is a more contemporary style. What if I choose to remove the Hood Protector? We recommend that you seek professional assistance.